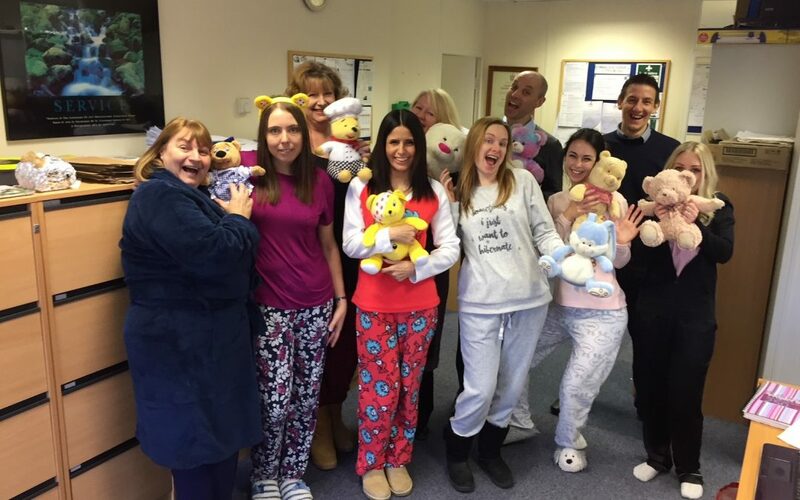 Supporting this year’s Children in Need Day on Friday 17th November, DeepClean Hygiene Solutions Ltd staff dressed in their pyjamas to raise money for this important, high profile charity. It was a relaxed day at DeepClean on Children In Need Day as staff came to work in their favourite nightwear as a fun way to raise money. Being charged £2 each for the privilege of a PJ Day, the staff really got into the spirit of things. Children In Need’s first appeal was broadcast on BBC One in 1980 in a new telethon format, hosted by Terry Wogan with Sue Lawley and Esther Rantzen. Aimed at raising funds for children who need support in the UK and across the globe, it certainly is the biggest one of its kind and goes from strength to strength each year. Businesses such as DeepClean Hygiene Solutions play an important part in fundraising and bringing new ideas to Children In Need, contribution to the record breaking totals they achieve. For more information about all the charity events that the DeepClean Team will be taking part in next year please call the Press Office on 01527 559880 or alternatively email info@deepclean-hygiene.co.uk.